Now THIS is a Suite! 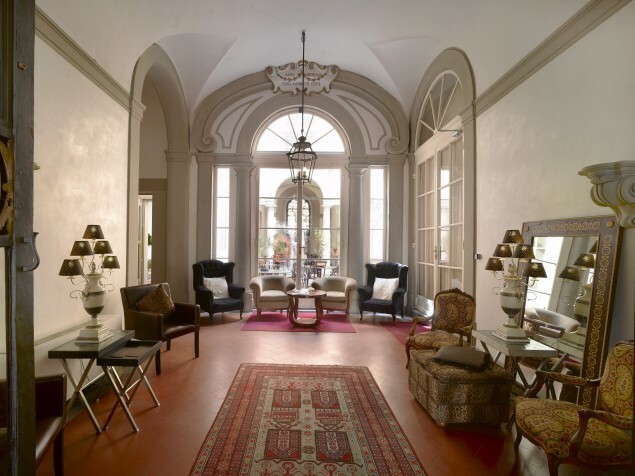 An 18th century palace built for a Papal treasurer is now a most romantic and exclusive Florence destination, of great historic beauty and classic contemporary interiors. 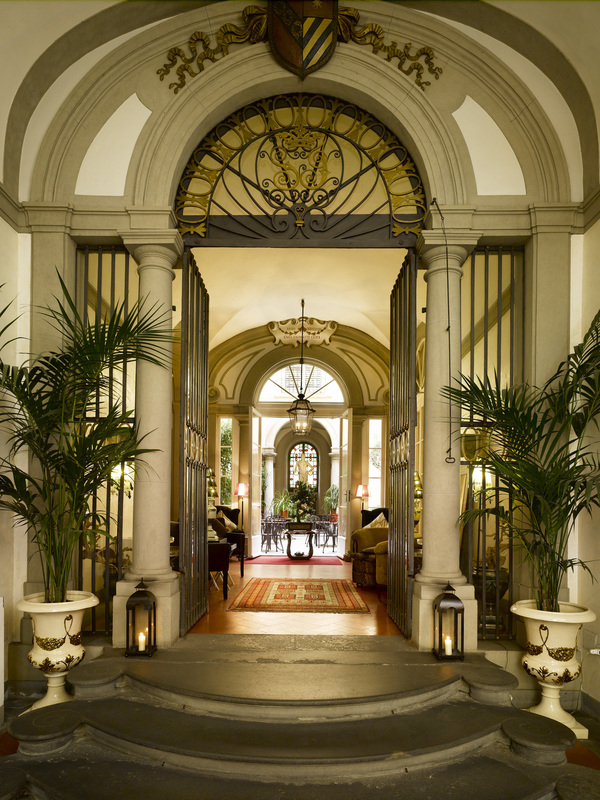 Once the Florentine home of the Marquis Baldinucci, a Vatican treasurer, the palace is now the absolutely gorgeous Relais Santa Croce hotel. Built in the early 1700s, this petite palazzo is intimate in size yet extremely rich in architectural detail and decoration. The Relais Santa Croce, a Baglioni luxury hotel and a member of the exclusive Relais & Chateaux family, has only 24 rooms and suites. It is a perfect honeymoon destination and is ideal for exclusive use by groups for any occasion. The prominent and most elegant features of the hotel are the painted ceiling frescoes. These are located in the salons, the hotel restaurant, and our favorite suite. These magnificent historic spaces are further dramatized by their great interior heights and the thoughtful integration of contemporary Italian furnishings. All 24 guest rooms are elegant and very well appointed. Some rooms have 4-poster beds, private balconies, or views of the Cathedral Santa Maria Della Fiori or the Basilica Santa Croce. Rooms on the top floor feature original exposed roof beams. The suites at Relais Santa Croce are in a class by themselves. These wondrous spaces are as large as an individual residence, and feature the best in interior finishes and Italian furniture design. 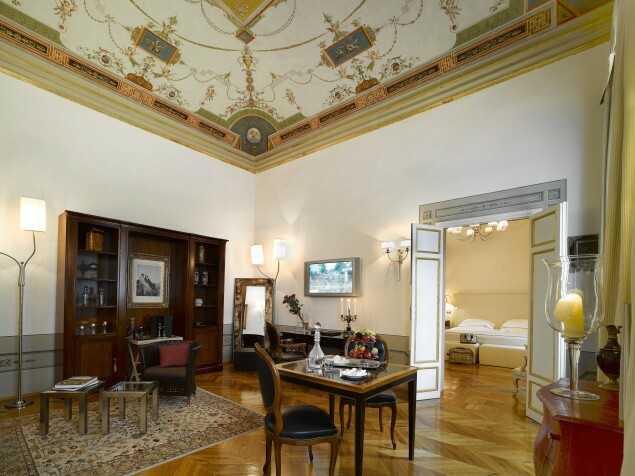 The Pepi de Presidential Suite features the stunning painted ceiling frescoes. 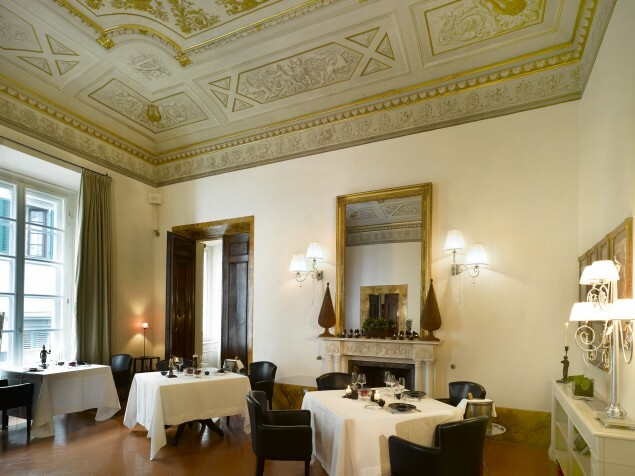 Relais Santa Croce offers a choice of dining experiences that would have impressed even a Papal finance minister. The hotel’s main restaurant, Guelfie Ghibellini, offers Tuscan cuisine geared to the well-accustomed palate. The graceful and historic setting is hard to match. Fronting the street is the award-winning Enoteca Pinchiorri restaurant. The longtime collaboration of Georgio Pinchiorri and Anne Fiolde, and a two-chef kitchen, has resulted in an extraordinary dining experience. 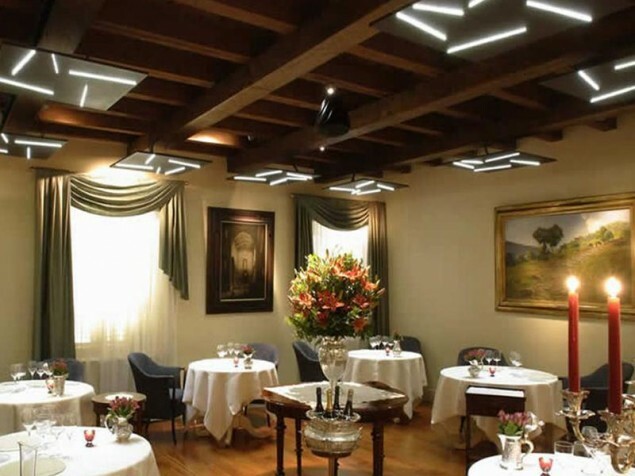 Enoteca Pinchiorri has the highest honor of being awarded 3 Michelin Stars, one of only seven in Italy in 2012. 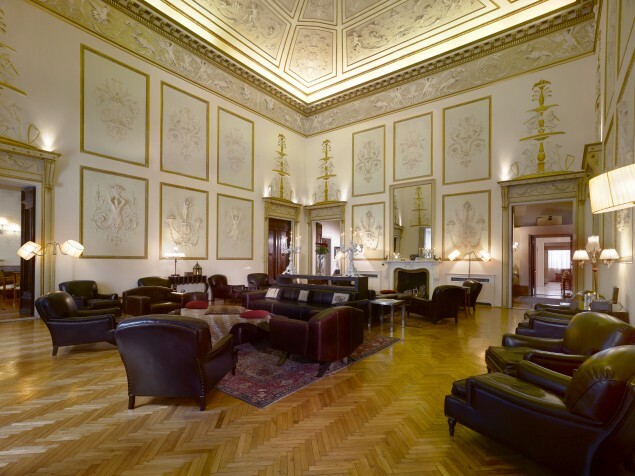 The beautiful Sala della Musica, one of the hotel’s historic lounges, offers an elegant setting for casual meetings and cocktail receptions. There is also a dedicated room for cigar enthusiasts. Formal meetings and larger events can be arranged at recommended off-site locations throughout historic Florence. 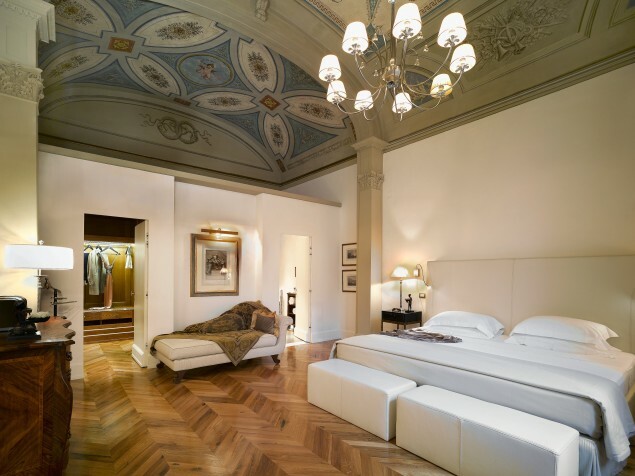 Relais Santa Croce represents the ultimate Italian small luxury hotel experience. It features the most beautiful elements of 18th century Florentine design, the ambiance of a great palazzo on a more approachable scale, and the very best of Italian cuisine. It is uniquely suited for both a romantic getaway and the high-powered executive retreat. 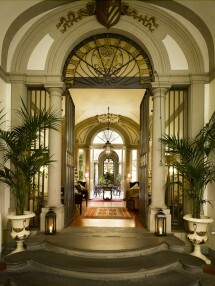 We could endlessly list why we love Relais Santa Croce; but, simply put, it is so much more than the sum of its parts.